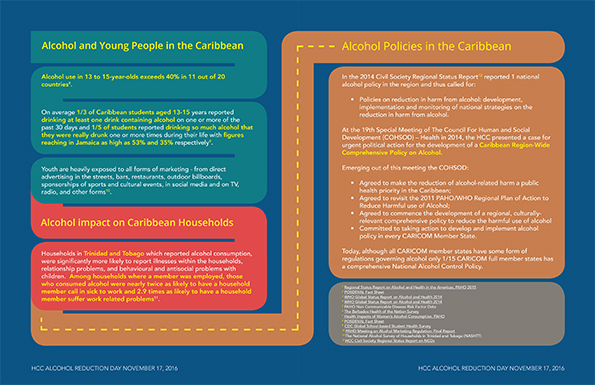 The “First Annual Caribbean Alcohol Reduction Day: Misuse of alcohol is a bigger problem than you think”, is an initiative of the Healthy Caribbean Coalition (HCC) aimed at sensitising the people of the Caribbean to the harmful effects of abuse of alcohol and encouraging them to “drink less and live better”. Excessive drinking of alcohol is a major health risk, occurring particularly increasingly among the youth of the Region resulting in alcohol related violent deaths among the top 5 causes of death in the Region and the commonest cause of death among young men. Additionally, abuse of alcohol is one of the 4 major risk factors contributing to chronic non-communicable diseases (NCDs), especially cancers, heart disease and stroke and there is an association between mental health and alcohol abuse. 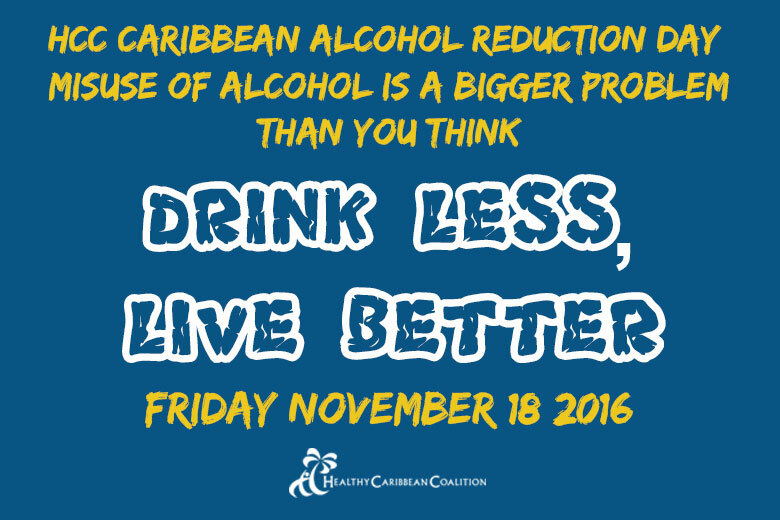 The First Annual Caribbean Alcohol Reduction Day takes the form of the topic of alcohol being exclusively featured in the HCC weekly Roundup, 18th November 2016. 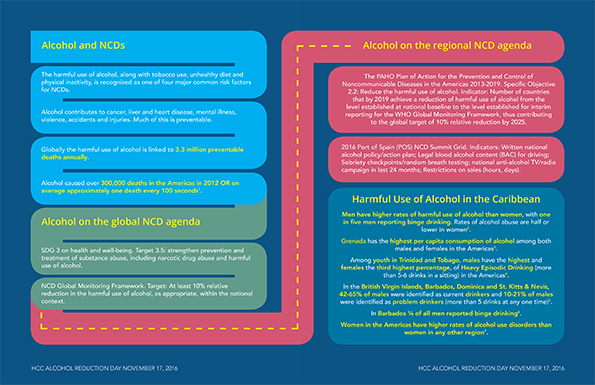 The Alcohol Reduction Day Roundup features messages of support, information on Global/ Regional Alcohol related targets, resources and information arising out of activities that the HCC conducted over the past several years aimed at reduced alcohol consumption in the Caribbean. The Roundup provides significant reference material of particular interest to the Caribbean to assist organisations and individuals in the Region wishing to address the issue of alcohol abuse in the Caribbean. 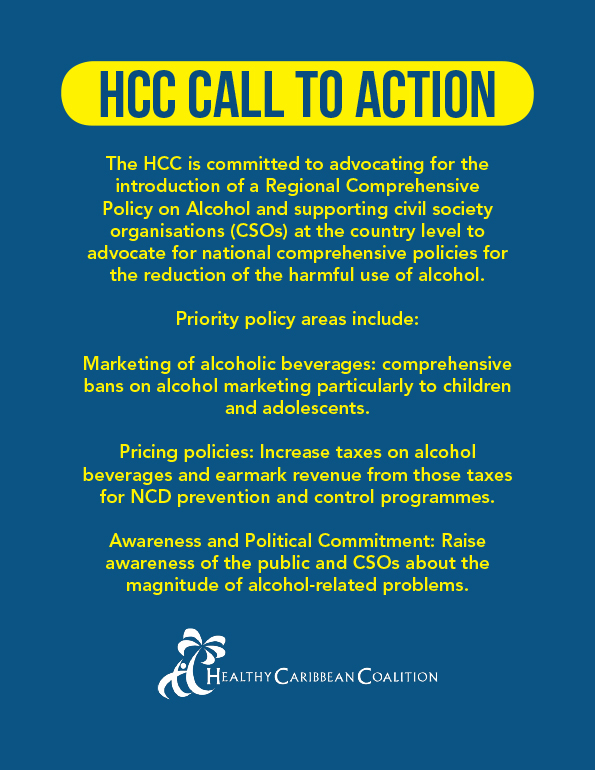 The Directors of the HCC are hopeful that this initial modest effort at the establishment of an Annual Day of recognition of the harmful effects of excessive drinking of alcohol in the Caribbean will in subsequent years become a major event in the Annual calendar of health events in the Region, supported and sponsored by national governments and the major public health institutions of the Region, including PAHO/WHO, CARPHA and others, as we seek to address this significant cause of sickness and death with attendant economic consequences and costs for the people of the Caribbean. Let us then go forward with the expectation that – “Great oaks from little acorns grow”.